Videogame/comic nerds are about to get a dream crossover for tabletop combat. When it comes to hobbies, it doesn't get much nerdier than HeroClix. The game combines tabletop strategy with comic book characters. 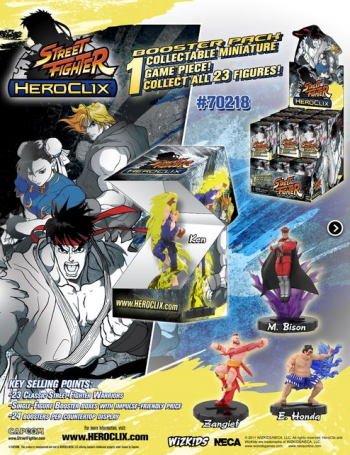 That said, HeroClix is about to outdo itself, since it's just been revealed that a Street Fighter expansion is coming to stores in the near future. So, basically, this will be a combination of tabeltop strategy, comic books (which Street Fighter has had), and videogames. How delightfully nerdy is that? The new expansion set will include both a six-figure starter pack, as well as twenty-seven other assorted Clix figures (which will be sold via single-character booster packs). According to WizKids, the starter set will actually feature unique characters for players to use: "These 6 sculpts are COMPLETELY REDIALED with ALTERNATE PAINT SCHEMES from the base Street Fighter Set. These 6 sculpts feature the impressive clear effects that make this starter kit a must have for any Street Fighter fan!" WizKids has also promised that the system will be compatible with other HeroClix figures. The figures are due out in August, which means those of us who play (yes, I'm a proud member of said group) can finally fulfill our life-long dream of pitting M. Bison against Black Adam. Or, you know, any other ridiculous match-up you can think of.